For Jak’s last birthday, I gave him peace of mind. Also, sushi. 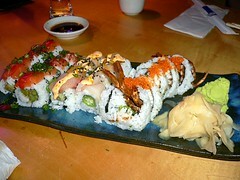 Our mutual favorite restaurant in the area is Mashiko Sushi, way down in West Seattle. These days we eat out very rarely — a bit less than once per month — but we spend more time at Mashiko than anywhere else, in no small part because it’s one of the few things that I can’t duplicate (or improve upon!) at home. The main issue with eating out on a tight budget is that some of the pleasure is offset by stress over money. 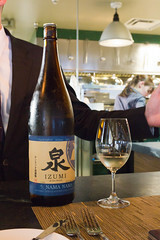 When one is looking over the menu, one has to evaluate not just how gratifying each item would be, but track the total expenditure and make tradeoff decisions: should I have a second sake? or save the money for dessert? While this is good for one’s finances, it’s not so great for relaxation or enjoyment. So when I decided to give Jak some Mashiko for his birthday, I also spent a fair amount of time thinking about the best way of arranging the gift — an economist would say ‘maximizing the utility’ — so that it had the most psychological, as well as financial, value. The classic choice — the way I probably would have handled it before I became a behavioral economics geek — was to wait until the bill came, and then pick up the whole tab. While that moment of surprise would be gratifying for me, it would do nothing to alleviate Jak’s concern about cost throughout the meal. Alternatively, I could tell Jak up front that I would pay for his entire dinner. The psychological downside to that was that either a) Jak would worry about how much of my money he was spending, and so agonize over his decisions as much or more as if he were paying for it, or b) he would not worry at all, in which case I would spend the entire dinner calculating a running total and growing increasingly anxious, making me very poor company. From a mental accounting point of view, Jak just got a $30 windfall. The amount was pre-set, so he wouldn’t have to worry about the effect on me of his spending too much. The $40 that he was planning to spend just became $70 — enough that he could order whatever he wanted without worrying about the cost. At the same time, I could count that $30 as spent and not worry about it anymore, either. An important component of the gift was that I stipulated that it be spent on dinner at Mashiko. Psychologically, that was very different from handing him $30 in cash. Thirty unallotted dollars would simply have been sucked into his allowance pool, to be stressed over and maybe not even spent on himself at all. But by specifying that the gift was to supplement his Mashiko experience, I gave him something he wanted but could never have gotten on his own: an excellent dinner free from stress, worry, and guilt. This may seem like a lot of geeky thought to put into a very simple gift, but it paid off. Jak appreciated it a great deal, and I got to watch him happy to have all the sake he could drink (and still drive). It was a more memorable and pleasurable meal for both of us than one where we each paid our own way. Life experiences result in more lasting happiness than material possessions. If you’ve got $100 to spend on your sweetheart, a nice restaurant dinner or a pair of theater tickets would be a better bet than a gadget or a piece of jewelry. Other people are less like you than you think. Unappreciated gifts often occur as a result of our egocentric bias to assume that other people will value the same things we do. It’s tough to really get inside someone else’s head when choosing a gift, but the effort matters. The more materialistic your Christmas celebration, the less likely you are to enjoy it. The best predictor of holiday happiness? Spending time with your family and loved ones. Maybe instead of shipping an object, you should buy yourself (or someone else) a plane ticket. Whatever your budget, remember that thoughtfulness is what matters most. And if you can do your thinking like a behavioral economist, so much the better! Excellent article, and gives me a lot to think about–not just for Christmas, which our family has already quite happily pared down by several hundred percent over the last few years–but for gift-giving and its attendant anxieties in general.